Easter is a time of reflection. from the grave of justice. and humankind is reconciled to God! to drive away all darkness. way and leaves some tasty treats. The fun of the game. 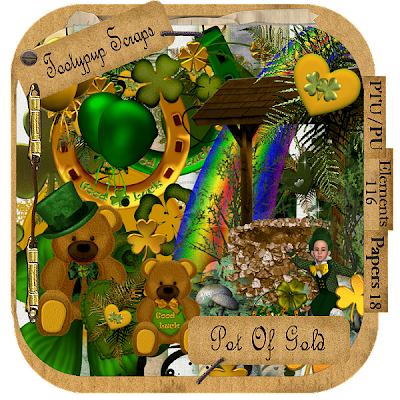 It is a perfect add on to the kit "The Prayer"
A St Patrick's Day Kit from the PUP to you. Oh to be....To find a Pot Of Gold at the end of a rainbow. This is a beautiful kit full of all that a little girl loves. Using the PUP's kit "The Prayer"
Oh Emma, thank you so much sweetie. kits that the PUP made. Our Maiden Voyage has come to an end. off here at my station. I hope you enjoy my part of the train. in all the stores I sell through tomorrow. Reflecting back to a time now long past. To when dreams are goals for a child to reach out for. To be free from to play the games children play. When you run in the sun and have so much fun. This kit is full of the memories I hope in my heart. There is so much here that will bring that time back to you mind. after doing the preview. There is 107 elements for you to play with. Ready for the Brat Pack? around 24 hours from now, depending on where you are in the world! This Kit is gorgeous in every way. The elements are truly everything from a little girls dreams. As the starts fill the night skies, when our dreams come to be. Bring us back to the days realities. I love this kit and putting it together for you. 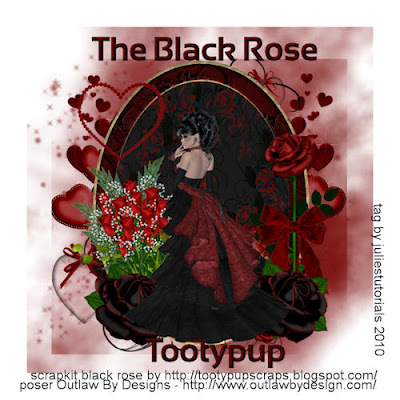 Another one using "Black Rose"
Hello Everyone. Well the PUP has been playing again. Here is my latest Kit. Yes another Valentines Day kit. 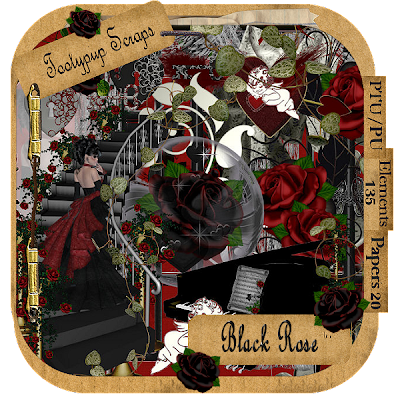 The Black Rose is the most beautiful Rose. The velvety touch of the petals. The beautiful fragrance that touches your heart. And sends a feeling of love through your veins. This kit can show the one you love how much they truly mean to you. This kit has so much in it for you to play with. There is 135 elements and 20 papers for you to play with. for Valentines day. So there is well over 135 elements.